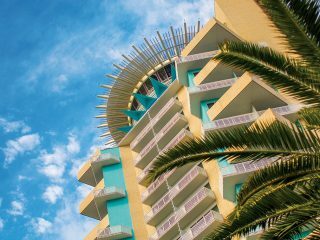 Faced with increasing competition from PortMiami to the south and Port Canaveral to the north, Port Everglades is ambitiously updating its facilities for both people and goods. 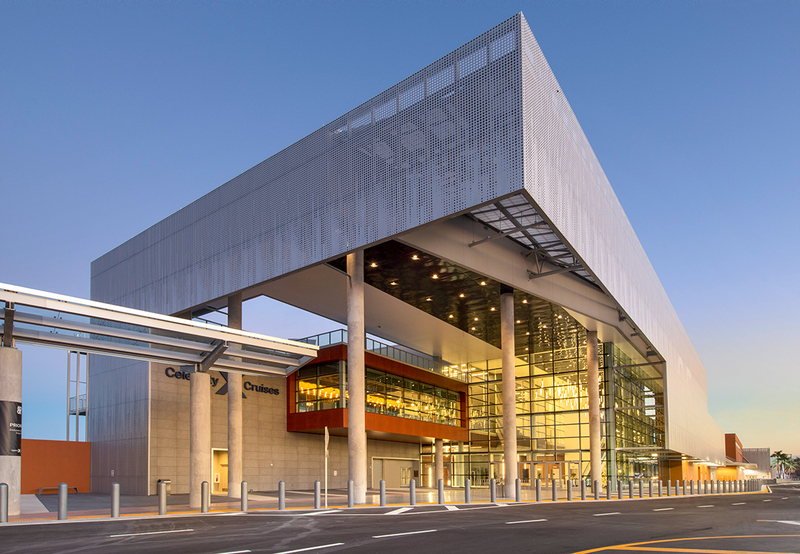 A new technology-packed terminal at Port Everglades is designed to give cruise passengers a leisurely sense that their vacation starts before they board the ship. Facial recognition software speeds the check-in process for many passengers, and for others, mobile agents with computer tablets complement the agents stationed at check-in counters. 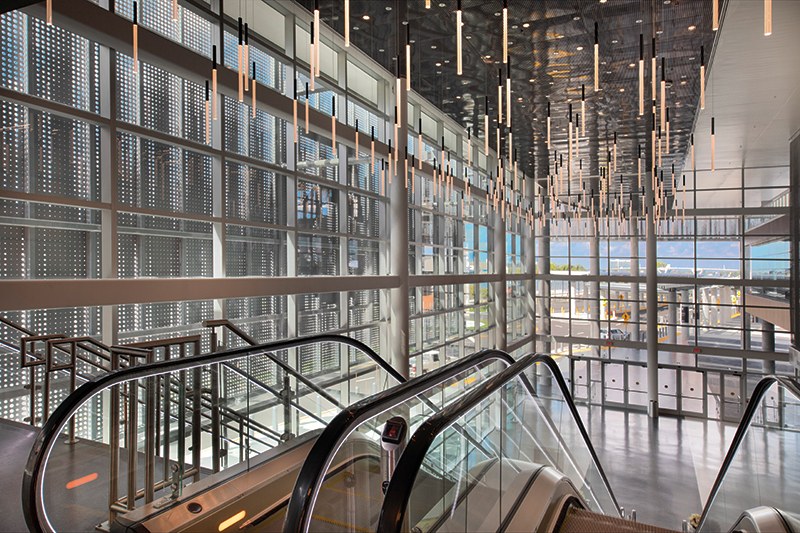 Even the biggest artwork is high tech: On the back wall of the check-in area, a 300-foot interactive art installation depicts a metallic map of the world’s 24 time zones, with a lighted area that smartphone users can move east or west, from zone to zone. 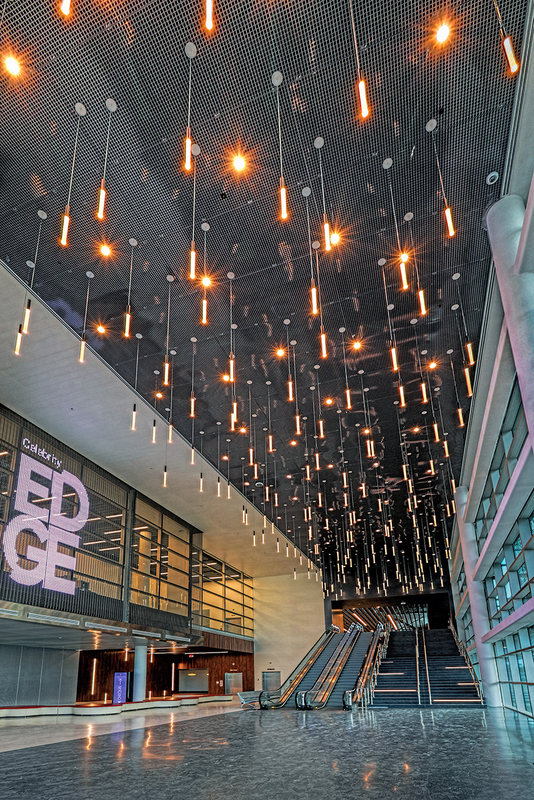 Opened in November, Terminal 25 (or T25) is owned by Port Everglades but largely designed by Celebrity Cruises as the operating base for Celebrity Edge, a new cruise ship with room for 2,918 passengers. The signature feature of the Edge is a big elevator-style space called the “Magic Carpet” that goes up and down the ship’s starboard side, from deck to deck. 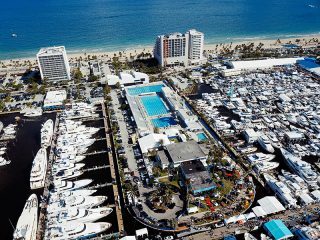 The new ship and passenger terminal promise welcome growth in Celebrity’s passenger traffic at Port Everglades, which is expected to rise to about 500,000 a year, well above the cruise line’s historic annual average of about 335,000. 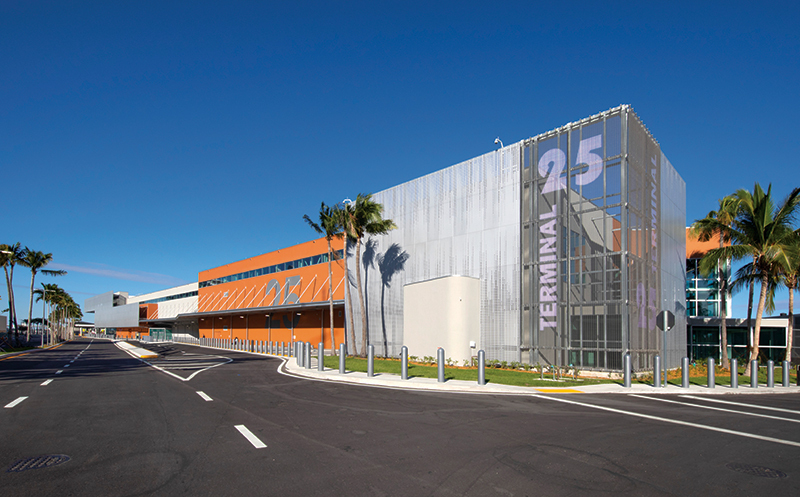 Developed at a cost of about $120 million, Terminal 25 is the most expensive cruise-terminal investment in the history of Port Everglades. But it probably won’t be the port’s last high-priced project to serve as a landside haven for cruise passengers. The T25 project may be a major step toward pushing the port past its 2014 record for passenger traffic. “The feedback we’re getting on the terminal is absolutely in sync with the ship. People really feel they’re starting their experience on the Edge as they’re coming into the terminal,” says Meaghan Gies, port captain for Royal Caribbean International, part of a family of cruise lines that includes Celebrity Cruises and Silversea Cruises, which also operate at Port Everglades. A boost to the cruise side of Port Everglades’ operations is overdue. 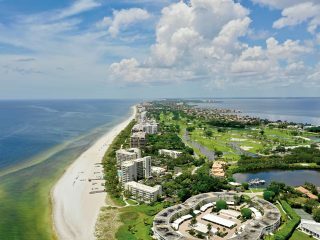 It remains the third-busiest cruise port on the planet, behind number one PortMiami and second-ranked Port Canaveral, about 45 miles east of Orlando International Airport. But in recent years, Port Everglades’ passenger traffic has flattened. It peaked at 4 million in 2014 and stayed below that record level in each of the last four years. At the same time, annual passenger traffic increased from 2014 to 2018 by 9.6 percent to 4.5 million at Port Canaveral and by 13.2 percent to 5.5 million at PortMiami. “Miami has invested a lot. They appear to be ahead of the game,” says Steve Cernak, chief executive and port director at Port Everglades. Meanwhile, Disney Cruise Line has propelled passenger growth at Port Canaveral due to the port’s proximity to Disney World. “Canaveral has built its market share on Disney World,” he says. 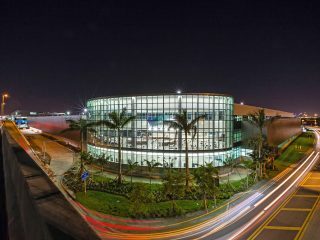 Beyond Terminal 25, Port Everglades has helped to upgrade the experience of passengers at other facilities, too. 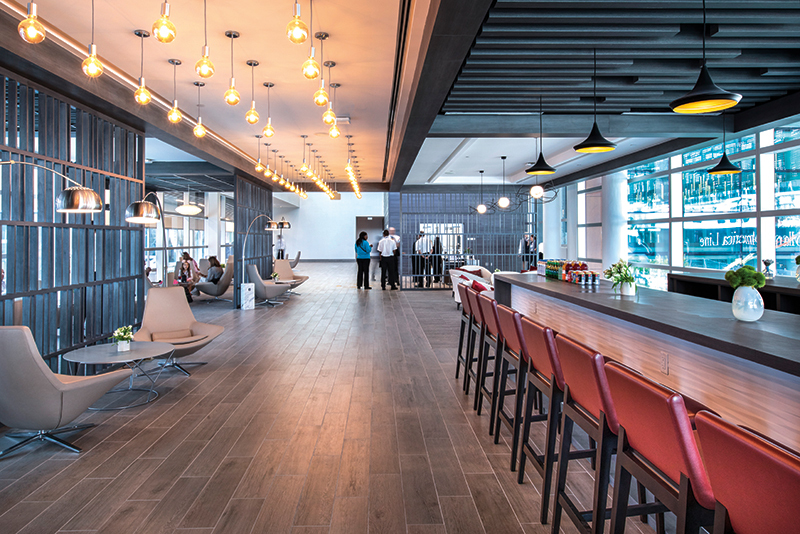 For example, Terminal 2 is where Princess Cruises operates two ships equipped for wearable technology known as an Ocean Medallion, which hastens check-in and boarding, serves as a room key and reminds bartenders what you ordered the day before, among other tricks. Princess passengers get the wearable medallions by mail prior to travel by checking in online. Terminal 2 has been wired for Ocean Medallion technology, which has been deployed on the 3,114-passenger Caribbean Princess and the 3,560-passenger Regal Princess at the direction of Carnival Corp. Carnival is the Miami-based parent company of Princess Cruises, Carnival Cruise Lines and three other lines that operate at Port Everglades: Costa Cruises, Cunard and Holland America Line. Though cruise-passenger traffic has flattened, Port Everglades is still growing on the cargo side of its operations. 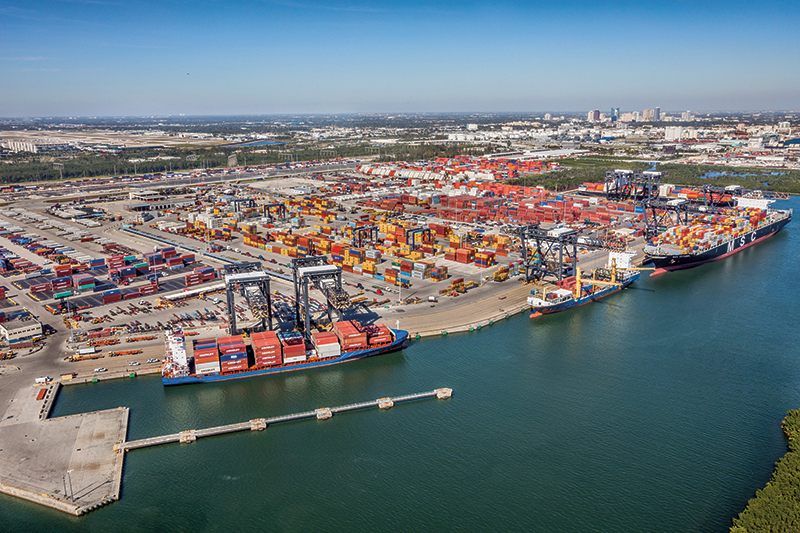 During the port’s 2018 fiscal year, which ended September 30, the volume of containerized cargo reached a record 1.1 million TEUs (or 20-foot equivalent units, the industry’s standard measure of container volume), a 3 percent increase from 2017. In addition, the port’s volume of non-container cargo – mostly cement, steel rebar and other building materials – increased 2 percent in 2018. Port infrastructure is a key factor in cargo growth. Just ask Patrick Collins, vice president of terminal operations at Port Everglades for Jacksonville-based Crowley Marine, a leading cargo carrier. Collins credits the extension of an Interstate 595 overpass to the front door of Port Everglades in 2014 and, in the same year, the relocation of Florida East Coast Railway’s intermodal cargo container facility, where shipments shuttle between freight trains and cargo ships. Projects underway at Crowley’s 78-acre terminal include increasing the number of shore-power plugs for refrigerated containers from 216 to 296 and building an inspection dock for the U.S. Department of Agriculture and Customs and Border Protection inspections of perishable shipments of produce and other cargo. It all comes with the territory at Crowley. “We are the largest refrigerated perishable handler in all of Florida,” Collins says. Crowley and other ocean cargo carriers have hoisted Port Everglades to a lofty perch in perishables. Everglades ranks fifth among U.S. ports in perishable shipment volume, up from seventh in 2014, thanks largely to more imports such as Peruvian asparagus, Central American melons and Chilean grapes and blueberries. The mix of goods passing through Port Everglades ranges from apparel to automobiles, and the port is preparing to handle bigger volumes. For heavy cargo, Port Everglades has ordered three gantry cranes valued at $13.8 million each and has options to buy three more over the next five years. There are now seven gantry cranes the south side of the port, known as Southport, and their lift capacity will be increased from 46.5 tons to 65 tons. 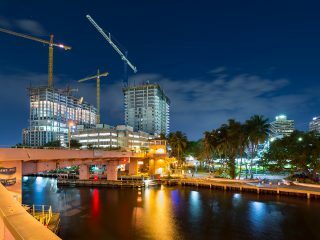 The new cranes are part of the largest expansion project in the history of Port Everglades. It will lengthen the existing deep-water turnaround area for cargo ships from 900 feet to 2,400 feet and will allow for up to five new berths for cargo ships. Financing all those port improvements is another story. While Port Everglades maintains a solid bond rating, the port’s big-ticket capital spending plans conceivably could strain its future borrowing ability. Fitch Ratings has an ‘A’ rating on senior bonds secured by revenue at Port Everglades. 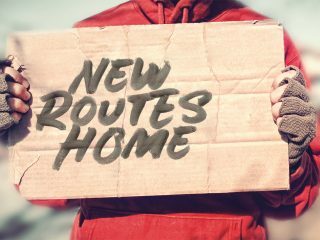 The New York-based bond rating also has a “stable” outlook for the rating, revised downward since May 10 from a “positive” outlook. Port Everglades also has a more diversified flow of revenues than some other seaports, including Port Canaveral, which handles less cargo and depends more on cruise traffic. Port Everglades is exposed to changes in discretionary consumer spending on cruise vacations as well as competitive pressure from other ports, Tricerri says. 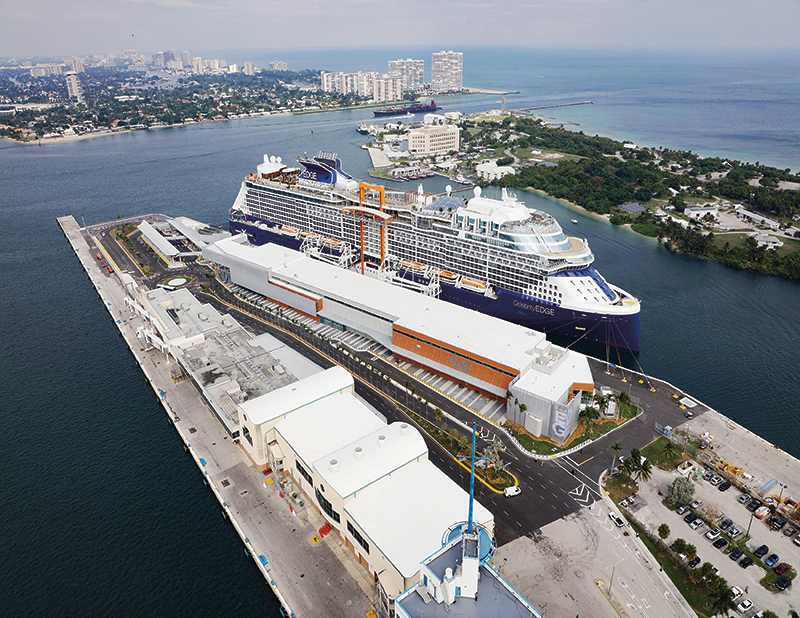 Indeed, T25 could have a multiplier effect beyond Celebrity Cruises if other cruise lines engage Port Everglades in brand-driven development of passenger terminals. 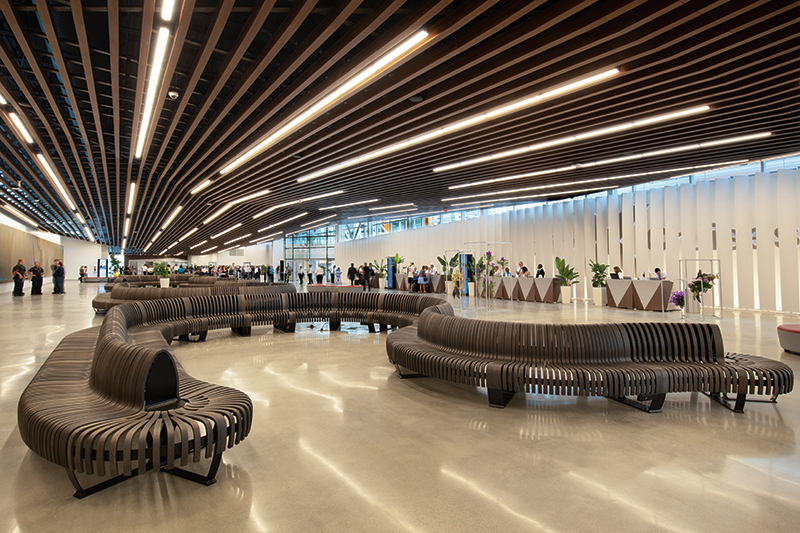 “In the future, I think you will see that happening in more places because it creates such a successful product,” says Gies, the port captain who oversaw the development of Terminal 25, where furnishings and finishes are designed to resemble those aboard the new Celebrity Edge cruise ship.